What caused the rise of Chicago, and how did the city's expansion fuel the westward movement of the American frontier – and influence the type of society that evolved as a result? Nature's Metropolis emerged as a result of William Cronon asking and answering those questions, and the work can usefully be seen as an extended example of the critical thinking skill of problem-solving in action. Cronon navigates a path between the followers of Frederick Jackson Turner, author of the thesis that American character was shaped by the experience of the frontier, and revisionists who sought to suggest that the rugged individualism Turner depicted as a creation of life in the West was little but a fiction. For Cronon, the most productive question to ask was not whether or not men forged in the liberty-loving furnace of the Wild West had the sort of impact on America that Turner posited, but the quite different one of how capitalism and political economy had combined to drive the westward expansion of the US. For Cronon, individualism was scarcely even possible in a capitalist machine in which humans were little more than cogs, and the needs and demands of capital, not capitalists, prevailed. 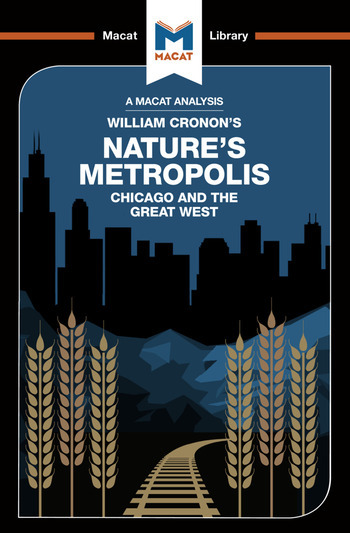 Nature's Metropolis, then, is a work in which the rise of Chicago is explained by generating alternative possibilities, and one that uses a rigorous study of the evidence to decide between competing solutions to the problem. It is also a fine work of interpretation, for a large part of Cronon's argument revolves around his attempt to define exactly what is rural, and what is urban, and how the two interact to create a novel economic force. Dr Cheryl Hudson holds a PhD in history from Vanderbilt University, where her work examined the political culture of Chicago, 1890-1930. Currently a University Teacher in American history at the University of Liverpool, she has taught at universities in the UK and the USA, including Oxford, Sheffield, Coventry, Vanderbilt and Sussex and is a former director of the academic programme at the Rothermere American Institute, University of Oxford.